*You need to create at least two Metadata Sets in order to perform the below steps. Metadata sets can be connected via drop down menus, meaning that if a user chooses a specific drop down selection (entry), a specific metadata set will be loaded. 6. Next to each drop-down entry is a drop-down menu called “Target”. 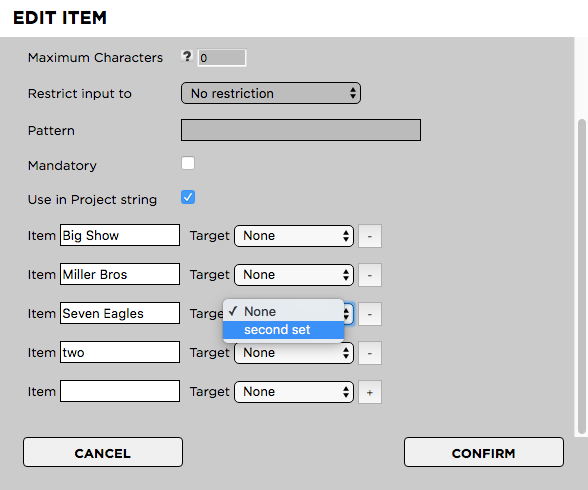 Go to the drop-down entry for which you want to load a specific target and choose that target from the list of targets.